Wish you could hold your style without masking it in crunchy stiffness? 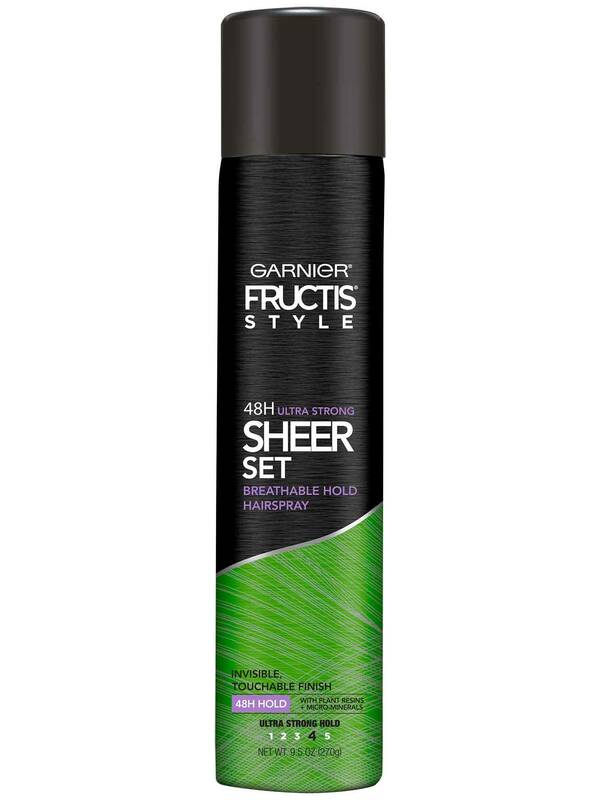 Garnier Fructis Style Sheer Set is a micro-diffusion, quick-dry, breathable hold hairspray that provides 48-hour ultra strong hold with an invisible, lightweight, touchable finish. Your style stays true. Micro-Resinite dual-technology combines plant resins and micro-minerals, providing a strong, yet breathable hold. Ultra-fine diffusion ensures a weightless, natural finish. Its water-free and humidity resistant properties provide ultimate, lasting control, letting you show off your style ... nonstop! Our light, sparkling fruit fragrance will leave your hair smelling fresh and vibrant. Hold can 10 to 12 inches from hair and spray in an even, all-around motion. Layer where it's needed most for added hold. 1157965 A ALCOHOL DENAT, HYDROFLUOROCARBON 152A, VA/CROTONATES/VINYL NEODECANOATE COPOLYMER, OCTYLACRYLAMIDE/ACRYLATES/BUTYLAMINOETHYL METHACRYLATE COPOLYMER, AMINOETHYL PROPANOL, PARFUM/FRAGRANCE, LINALOOL, LIMONENE, CANARIUM LUZONICUM/CANARIUM LUZONICUM GUM NONVOLATILES, MAGNESIUM ACETATE, AMYL CINNAMAL. F.I.L. D180245/1. Rated 5 out of 5 by Tisha5 from Best hairspray ever - Please bring back!! I ran out and have been unable to find this and now I know why! I am so disappointed! This was the best hairspray for holding my fine hair in all sorts of weather. I tried another Garnier hairspray product and absolutely hate it. I guess I will be switching to another brand of products. Good-bye Garnier. Rated 5 out of 5 by sadly very disappointed from WHY DISCONTINUED???? This hairspray is the best I have ever used, and by the looks of the reviews from other customers I believe they would agree!! So with that being said, why in the world would you discontinue this product????? Rated 5 out of 5 by NanaTia from the Sheer Set Hair sprays are the very best I use this and the Extreme Hold Sheer Set as well , and YOUR HAIRSPRAYS BEAT THE TOP OF THE LINE $$$$$$ FANCY SALON SPRAYS !!!! i have baby fine just grown back in ( salon hair disaster caused major damage and fall out of most of my hair) store bought colored oily hair that tends to be fly away and easily weighed down or greased up by hair sprays .... I even tried specialty thickening hairspray made for fine thin hair( it made my hair stiff and crunchy and it smelled horrible ) and I have never in the past 40 years of being a hair fanatic have i ever found hairsprays this GREAT! with an awesome fragrance and soft STRONG TOUCHABLE feel!!! PLEASE MAKE THIS FOREVER!!!! 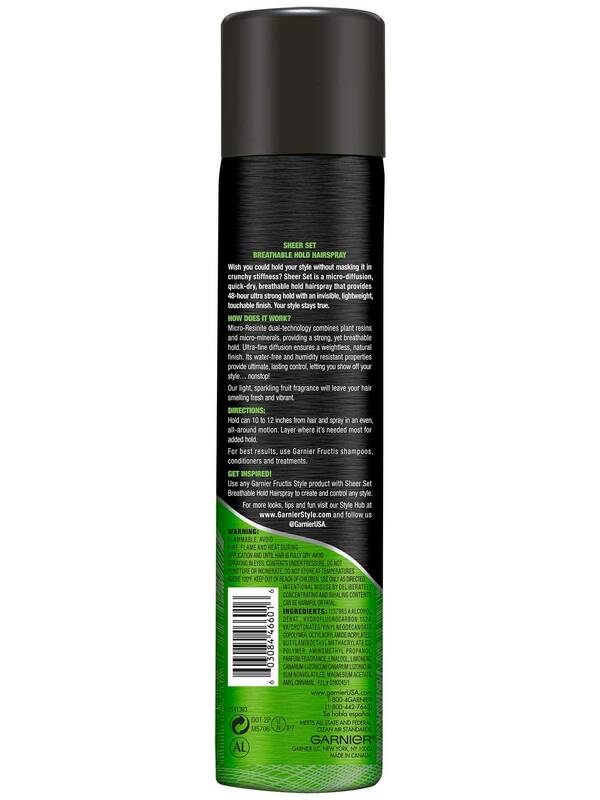 Rated 5 out of 5 by Martha6454 from Best Hairspray I waited until I was out of my regular hairspray before buying this product to try. Now I wish I hadn't waited - this is the best hairspray I have ever tried. I have fine hair prone to frizz & curl in the summer humidity - This hairspray is light enough that it doesn't coat or weigh my hair done, but seems to help shield against frizz while supporting my style. I hope you never stop making this product!! Rated 5 out of 5 by Anonymous from Garnier Fructis Sheer Set Hair Spray is great! I used it on my daughters hair for her recital and it kept everything sleek and shiny any my daughter didn't complain about the "hairspray" smell. Rated 5 out of 5 by AnelR from Garnier Fructis Sheer Set Hair Spray is really good and lets my hair hold and good shape! Rated 4 out of 5 by LeticiaS from Unfortunately my sample package did not include a sample of the hairspray, but if it is anything like the shampoo, conditioner and leave-in conditioner, I am sure it is awesome! I can't wait to give it a try!